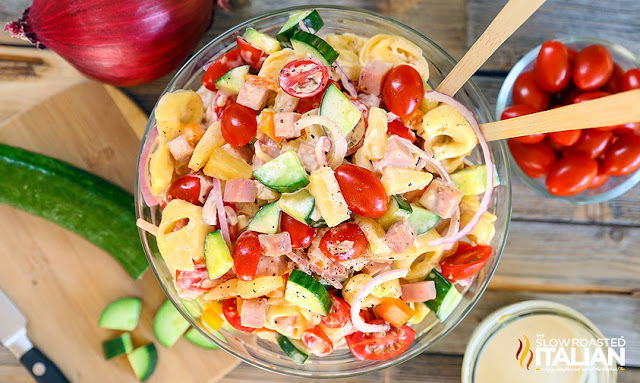 Hawaiian Tortellini Salad is a like a party in your mouth! It's a blend of your favorite island flavors in a fabulously bright, sweet and tangy summer pasta salad. A simple recipe with an outstanding pineapple-ginger dressing, this will be a hit everywhere you take it. Bring a large pot of water to a boil. Cook tortellini according to directions on the package. Drain and set aside once cooked. Chop ham and vegetables and set aside. Reserve pineapple juice from can for the dressing. Set aside. Combine salad ingredients in a large bowl. Set aside. In a pint size mason jar add dressing ingredients. Shake mason jar until dressing is combined. Pour dressing over salad and gently toss with salad tongs until well coated. Note - I left the ham out because I was serving it with Ham and Cheese Sliders.